India – Indian Premier League 2019: ‘Revamped’ Delhi Capitals gave a fitting tribute to Gautam Gambhir, who announced his retirement from all forms of cricket. Indian Premier League 2019: ‘Revamped’ Delhi Capitals gave a fitting tribute to Gautam Gambhir, who announced his retirement from all forms of cricket. 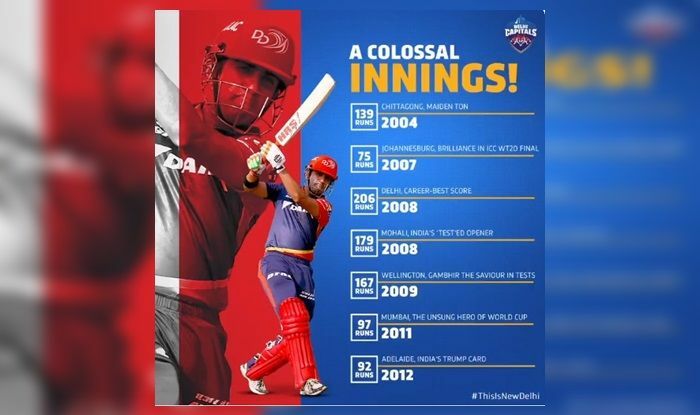 Gambhir was a part of Delhi Daredevils in 2018 but stepped down after six games. The southpaw’s career spanned 15 years, where he also led Kolkata Knight Riders franchise to two IPL titles and has been one of the leading run-getters in the history of the league. The southpaw has represented Team India in 58 Tests, 147 ODIs and 37 T20Is, managing to score more than 10000 runs in international cricket. Gambhir will be playing his last game as a professional cricketer when he steps onto the pitch for Delhi in the ongoing Ranji Trophy.